Microsoft now offers Focused Inbox, a feature that separates your inbox into two tabs: Focused and Other. It learns to identify your more important messages and prioritizes them in Focused. This feature replaces Clutter. Focused Inbox is currently available across platforms: Outlook for Windows, Outlook on the Web, Outlook.com, Outlook for Mac, and Mail for Windows 10. If you check your email on more than one device, you WILL have access to all your messages on every device, even though they may be divided between Focused and Other Inboxes on one device, and all contained in your single Inbox on another device. For more details, view Microsoft's Focused Inbox for Outlook page. In the Options column on the left, click Layout, then select Focused inbox. Select either Sort or Don't sort, as you prefer. To return to your mailbox, at the upper left, click Options (or the arrow next to it). 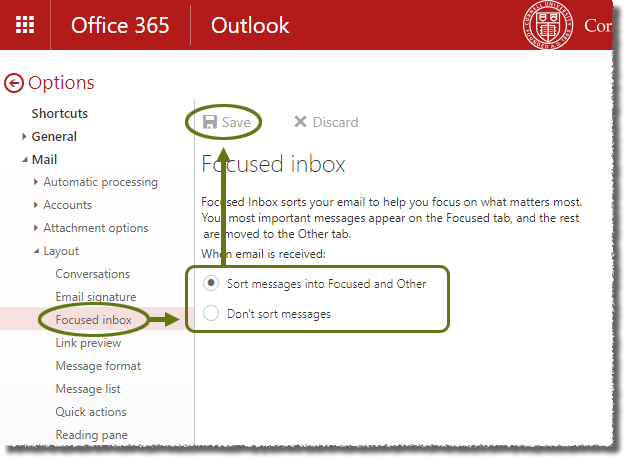 Microsoft's article describing how to train Focused Inbox will help you organize things in the way that suits you best.